England abolished beheading as a method of execution for traitors in 1973. As a method of execution for Chelsea managers? Not so much. Running a soccer team for Roman Abramovich is like being a high-profile death-row inmate convicted on a shaky case. Right down to the final moment, your supporters are hoping, protesting, staging vigils, reviewing evidence. Injustice is decried; websites are thrown up. Doesn’t matter. Sooner or later your moment arrives, a finger lifts in a shadowy stateroom, and the ax comes down. Di Matteo has won seven of his first nine matches and landed Chelsea in the semifinals of the Champions League, and the vigils-and-websites phase is officially under way. In the last couple of weeks, just about every soccer publication in English has run its version of the “Di Matteo deserves a chance” op-ed, ranging from the Mail‘s “Give Di Matteo the job, Roman!” to Fox’s “Di Matteo curing all Chelsea’s ills” to Soccernet’s “Di Matteo a man for all seasons?” Ex-Chelsea stalwarts like Marcel Desailly and Mark Bosnich are vaulting themselves into headlines by publicly urging Abramovich to hire Di Matteo full time. 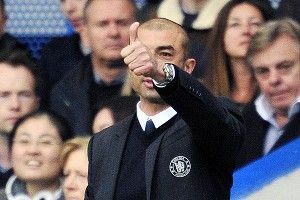 Rumors are circulating that if Chelsea win the Champions League, Abramovich will relent and offer Di Matteo a contract. So, you know, all you need to do to get a one-year extension at Chelsea is take over an aging, demoralized team mid-season, beat Barcelona, and win the European Championship. No biggie! You know what I’m sick of? This whole process. It’s not that I don’t think Di Matteo deserves the job. He does, probably; but if Chelsea had kept all the managers who probably deserved the job, Avram Grant’s jowls would still be swinging in London. Because Jose Mourinho was successful and charismatic at Stamford Bridge, and because Abramovich has lured (to their dooms!) big-name managers ranging from Phil Scolari to Carlo Ancelotti (not to leave out Guus Hiddink, the only boss to leave the club with his head still attached, and that only because he pre-offed himself by refusing to consider a long-term contract), we’ve gotten the idea that the manager of Chelsea is a position that matters, and that who occupies the chair is a question that’s worth worrying about. Here’s the thing, though: Chelsea is a high-profile club with the resources to burn through famous coaches, but — really — who has less power than the manager of Chelsea? The manager of Chelsea is subject not only to Abramovich’s maelstrom-class whims but also to the pretty deadly and expert political maneuvering of the Lampard/Terry/Cole old guard, which has knifed out multiple probably-deserving managers over the last five years, including, depending on which dark-alley whispers you believe, Mourinho himself. Think about all the ways in which the Chelsea manager’s freedom to act is limited by outside pressures. He gets killed if he picks the wrong team-sheet, killed if he plays in the wrong style, killed if he gives a bad press conference, killed if he doesn’t fulfill his boss’s deranged expectations, killed if he doesn’t satisfy a half-dozen unhinged egos, and killed, obviously, if he loses the wrong games (i.e., any of them). Could anybody really do this job, short of deploying the Hiddink tactic of genuinely not wanting it? Maybe Pep Guardiola could saunter into Stamford Bridge, recite a sestina about butterflies, and inspire the culture of the club to a happier place. I don’t know. It seems just as likely that Pep Guardiola, like everybody else, would be roadkill. So, sure, give Di Matteo a chance. Or (as is vastly more likely) punt him off the edge of a pier when he loses to Barcelona. But as long as Chelsea remains a hybrid of loopy owner tyranny and runaway player power, just don’t tell me it makes all that much difference.